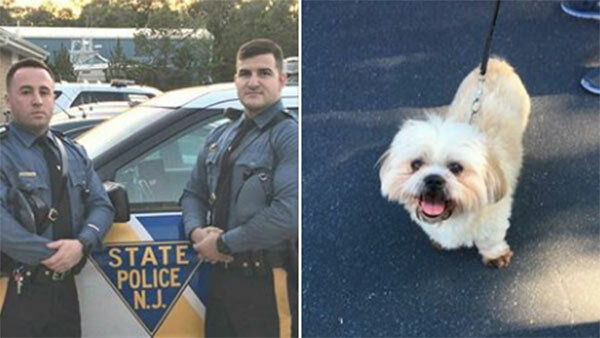 HAMMONTON, N.J. (WPVI) -- New Jersey State Police say two troopers rescued a small child and a dog after they were accidentally locked in a hot car. The incident happened on Friday in Hammonton. Police say a woman placed her 2-year-old grandson and her dog in the back seat of a car, closed the doors, then went to open the driver's side door. Police release video of troopers rescuing child, dog from hot car. However, that's when she noticed her keys were still on the passenger's seat, and all of the doors were locked. Police say she dialed 911, and soon Troopers Jacob Sherry and Steven Hodge arrived. Due to the heat, and that the troopers could see perspiration on the child, Hodge broke the window and Sherry got the child and dog out of the car. Police say this "The appreciative grandmother taught us all a very valuable lesson. Secure your keys before placing children and animals in cars."